Get set for a tenth collection filled with laughter, learning and exciting activities in the adventure club that every child will want to join! Meet Duggee, a big lovable dog who is the leader of The Squirrel Club, a place where The Squirrels take part in all kinds of activities, have adventures & earn activity badges along the way. In this new collection Duggee is the star of a fashion show! The Squirrels go sailing but encounter some ..
Own Hey Duggee - Bumper Collection DVD from Deff, DVD, Blu-Ray & 4K Video Specialists - Free UK Delivery..
Own Hey Duggee - Stick Badge & Other Stories DVD from Deff, DVD, Blu-Ray & 4K Video Specialists - Free UK Delivery..
Own Hey Duggee - The Be Careful Badge & Other Stories DVD from Deff, DVD, Blu-Ray & 4K Video Specialists - Free UK Delivery..
Duggee is a lovable brown dog who runs The Squirrel Club; a place where children take part in all sorts of exciting activities and earn badges for their accomplishments! Poor Norrie, she doesn’t feel well and can’t join her friends at squirrel club today. How can the squirrels make their friend feel better? They’ll make a card and take it to her! So the remaining squirrel club members climb onto Duggee’s back and set off to Norrie’s hou..
Own Hey Duggee - The Shape Badge & Other Stories DVD from Deff, DVD, Blu-Ray & 4K Video Specialists - Free UK Delivery..
Own Hey Duggee - The Super Squirrel Badge & Other Stories DVD from Deff, DVD, Blu-Ray & 4K Video Specialists - Free UK Delivery..
Get set for more laughter, learning and exciting activities in the adventure club that every child will want to join! 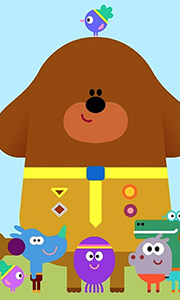 Meet Duggee, a big lovable dog who is the leader of an after school club called the Squirrels. Under the patient guidance of Duggee, the Squirrels discover new things about the world around them and earn badges for their accomplishments. In this DVD the squirrel Clubhouse gets a spring clean, Duggee's and the squirrels p..
Own Hey Duggee - The Tinsel Badge & Other Stories DVD from Deff, DVD, Blu-Ray & 4K Video Specialists - Free UK Delivery..
Own Hey Duggee - The Train Badge & Other Stories DVD from Deff, DVD, Blu-Ray & 4K Video Specialists - Free UK Delivery..
Get set for a ninth collection filled with laughter, learning and exciting activities in the adventure club that every child will want to join! Meet Duggee, a big lovable dog who is the leader of an after school club, called the Squirrels. Under the patient guidance of Duggee, the Squirrels discover new things about the world around them and their comic adventures encourage young viewers to actively solve a problem by moving, jumping, r..